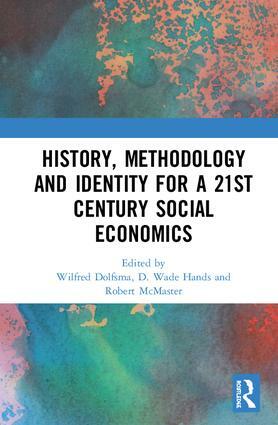 This book seeks to advance social economic analysis, economic methodology, and the history of economic thought in the context of twenty-first century scholarship and socio-economic concerns. Bringing together carefully selected chapters by leading scholars it examines the central contributions that John Davis has made to various areas of scholarship. In recent decades, criticisms of mainstream economics have rekindled interest in a number of areas of scholarly inquiry that were frequently ignored by mainstream economic theory and practice during the second half of the twentieth century, including social economics, economic methodology and history of economic thought. This book contributes to a growing literature on the revival of these areas of scholarship and highlights the pivotal role that John Davis’s work has played in the ongoing revival. Together, the international panel of contributors show how Davis’s insights in complexity theory, identity, and stratification are key to understanding a reconfigured economic methodology. They also reveal that Davis’ willingness to draw from multiple academic disciplines gives us a platform for interrogating mainstream economics and provides the basis for a humane yet scientific alternative. This unique volume will be essential reading for advanced students and researchers across social economics, history of economic thought, economic methodology, political economy and philosophy of social science. 5. Reflections on Reflexivity and Complexity, J. Barkley Rosser, Jr.
6. Understanding the Subaltern Native Middle Class, William Darity Jr.
Wilfred Dolfsma is Professor and Chair of Business Management & Organisation at Wageningen University, The Netherlands and Professor of Innovation & Strategy at the University of Curacao. He has published over 20 books and over 100 articles in international academic journals. D. Wade Hands is Distinguished Professor of Economics at the University of Puget Sound, USA and has taught history of economic thought for over thirty years. He has written on a wide range of topics in the history of economic thought and economic methodology. Robert McMaster is Professor of Political Economy in the Adam Smith Business School at the University of Glasgow, UK. He has published numerous academic articles and was a co-editor of the Review of Social Economy from 2005-2017.